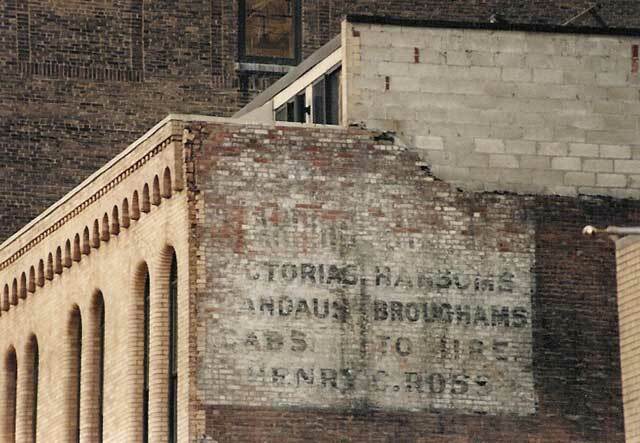 By 1873 Henry C. Ross had his own livery stable and continued in the business with a series of stables on 23rd, 24th and 26th streets from that date until his death in 1904. Interestingly, this one on 32nd street was a Henry C. Ross stable only between 1902 and 1907 (the business continued a few years after his death). Still, the sign with a date of 1902-7 is one of the oldest I am able to show on this site. Ross was born in Ontario county, New York, and appears in the 1850 U. S Census, age 6, living in Farmington, NY with his parents, Malcomb and Emeline Ross. Malcolm Ross gives his occupation as laborer. By 1870 Ross was 26 and living in New York City with his wife and young son, Charles Ross, age 3. The Ross family share housing with John Briggs and his family. John Briggs's brother Robert L. Briggs is also living at this address.